In the Beginning...Mini-T: Before Homo sapiens, before meteors annihilated Tyrannosaurus rex, before that massive dinosaur bounded over the earth, a smaller, similar looking dinosaur existed. Raptorex kriegsteini had 1/90th the body mass of the ~2.5 ton T.rex and lived about 65 million years earlier. A raptorex fossil found in China had the same body features as T. rex and scientists think that the specialized predatory morphology -- large jaw, small front legs, powerful back legs -- grew larger in future generations, evolving to become T. rex. 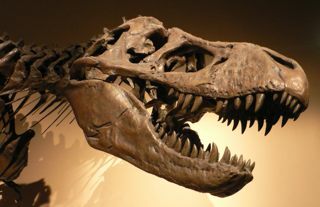 The photo is of a T. rex is from Wikipedia Commons. New Science Journalism: Futurity formally launched September 15. Futurity, not to be confused with "Singularity", is a collective on-line publication effort by leading research universities. The universities will promote their science accomplishments and fill the gaps of dwindling newspaper science coverage. Articles will be submitted by members of the Association of American Universities (AAU), with Stanford, University of Rochester, and Duke leading the effort. Critics point out that aggregating news generated by University PR departments (20% fact, 80% big story?) won't provide readers the same unbiased perspective as proper journalism coverage. True, but we can't ignore the fact that a significant amount of science coverage consists of press releases anyway. 1.) Egypt can't keep up with its street garbage. As we wrote earlier this year, Egypt set out to kill all the pigs in the country, an unwarranted action. Many belonged to Christian herders whose pigs cleaned the streets of millions of tons of organic waste per year. Now parts of Cairo are knee deep in garbage. 2.) Pork belly futures, which fell from 89 in April 2009 to 40 in August 2009, have now rebounded to their previous high. A Chance To Recalculate the Bush Ozone Ruling? : The Environmental Protection Agency (EPA) announced last week that it would reexamine the standard set by the Bush administration for ozone which had motivated states to sue the EPA. Ozone is a health hazard at certain levels, and in 2008, the agency set a new standard at 75 parts per billion (ppb), down from 84 ppm. The EPA heralded this as a life-saving improvement, but according to science advisors of the Clean Air Scientific Advisory Committee (CASAC), only 60-70 ppm will prevent deaths. Susan Dudley headed the Office of Information and Regulatory Affairs (OIRA) in 2008 when the Bush administration decision was made. OIRA influenced the outcome of Bush's ozone ruling by sending a series of memos to the EPA impeding the ozone ruling and killing a secondary standard which would have triggered certain safety measures in some weather conditions. We wrote last year how Susan Dudley had argued on behalf of industry prior to her tenure at OIRA, that "smog was beneficial because it protected individuals from ultraviolet radiation, and that since asthma rates were associated with poverty, a smog ruling would have the 'perverse effect' of costing communities money, which would in turn increase poverty and asthma." Her's was a twisted cost-benefit analysis. Now Cass Sunstein heads OIRA. According to the Environmental Defense Fund (EDF), the EPA has calculated the benefits to society from the now thriving environmental industry and determined that those monetary benefits outweigh the costs of the standard. So is cost-benefit ok when the outcome favors the politics you prefer? Team Players: Researchers at Oxford University published a paper in Biology Letters reporting that more elevated endorphin levels associated with team sports like rowing than single player activities. Justice Department On Proposed Google Books Settlement The Justice Department said Friday that the settlement needed changes to address copyright, class-action and antitrust issues, and urged the Federal Court to reject the settlement. However, the government added that current discussions between the parties were productive and should continue. EPA and NHTSA, Together At Last, Overlapping: The EPA also proposed new carbon dioxide emissions this week, in concert with the National Highway Traffic Safety Administration (NHTSA). The new rule would lower fleet standards to 35.5 mpg by 2016. As well, cars would be allowed to emit 250 grams of CO2/mile by 2012, as opposed to the current rule of 265 grams of CO2/mile. The Association of International Automobile Manufacturers, Inc. (AIAM), and Senator Markey praised the agencies for their collective effort. A coordinated effort from the two agencies that oversee automobile emissions and mileage efficiency has long been a goal of industry and policy makers, though a goal sometimes cynically pursued. We also wrote about EPA/NHTSA overlap here and here. The standards will cover model years 2012 through 2016, and as the Obama administration bills it: "the automobile manufacturers would be able to build a single, light-duty national fleet that satisfies all federal requirements as well as the standards of California and other states." "For the first time in my life, I'm going to go to Congress, and I'm going to be tenacious and be forceful and be honest and tell them that it's time. If you can give five million dollars to study flatulence in cows and its effects on the ozone layer, you can give me some money for migraine research." Migraines are, of course, a debilitating problem -- that's no joke. As McCain details in her talks, migraine headaches are sometimes set off by "triggers" -- foods like chocolate, or particular odors or chemicals. McCain reports that her company's beer, Stella Artois, contains sulfites "out the wazoo" that trigger her headaches. Travel is full of trouble. Sometimes a perfume bottle breaks and the debilitating noxious fumes cause her to repack her bags and fly home. Foreign food smells prove treacherous too, she says: "...like...forgive me, but the scent of cooking dog"
She didn't say which countries serve the offensive "dog", often a subject of nasty rumors, or how one can tell that it's not chicken, water buffalo, or frog. But fortunate she is then, that her role is the ambassador of headaches not the ambassador of smoothing international relations with her would-have-been President husband.